The first logical step to making any good decision is to consider all the possibilities and educate yourself. There are many different kinds of pens on the market today, but we're going to focus on the three most popular types for office use. Ballpoint pens use thick, permanent, non-water based ink that does not thin while you write. 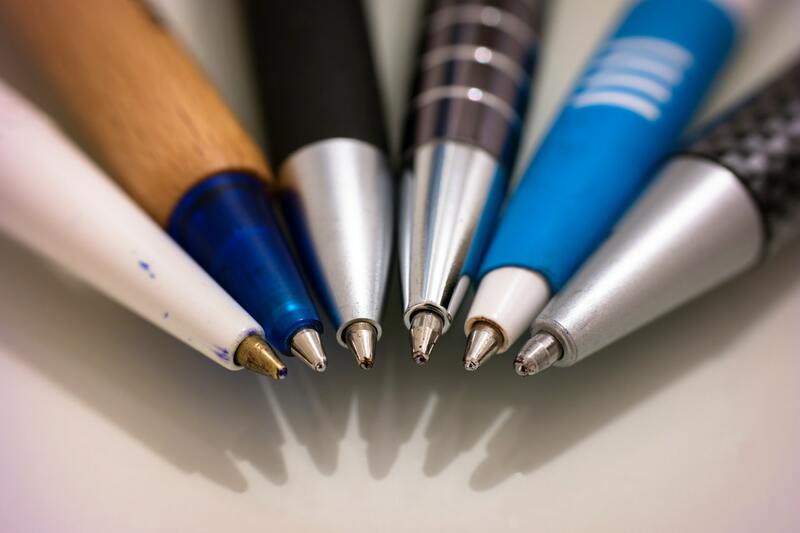 Ballpoint pens use a small rotating ball made of brass, steel, or tungsten carbide to dispense the ink as you write. Standard ballpoint pens come in fine, medium, and bold options depending upon the desired thickness of your line. Roller ball pens use water-based ink that takes very little effort to get flowing, allowing for a smooth write. These pens utilize the same type of ball as a ballpoint pen, but because the ink is much thinner, it floods the ball and "drags" a pool of ink across the paper as you write. The smaller the point size of your pen, the less ink there is to drag, thus producing a finer line. Roller ball pen ink is usually not permanent. Like ballpoint pens, you can choose the desired thickness of your lines with roller ball pens. Gel pens use water-based ink with a viscosity or "thickness" that can fluctuate (not the thickness of the line, necessarily, but the thickness of the liquid ink itself). When a gel pen is not being used, the ink tends to have a higher viscosity, or thicker ink. When the ball starts to rotate, the ink thins down and is "dragged" in a similar manner as roller ball ink. Micro, medium, and bold are the standard terms used to describe the line thickness of gel pens. Now that you understand the most common types of pens for office use, it's time to really think about what you will using the new pen for on a regular basis. Remember, the most expertly crafted pen in the world won't get the job done if it's not suited for what you need. Ballpoint pens are great for dependable, easy to maintain, and have a long life span. These are some of our best ballpoint pens for everyday use. Roller ball pens provide a very comfortable writing experience, which makes them perfect for journaling. For an easy flow of writing and a richer saturation than standard ballpoint pens, consider these roller ball options. Gel pens offer a smooth and attractive appearance with clean and precise lines. Here are some recommended gel pens for signing all your important documents. Perhaps you're looking for a new favorite writing utensil for daily use, buying bulk pens for the entire office, or searching for a special gift for your boss. Some pens are primarily decorative and make wonderful gifts. Meanwhile, other pens are designed for heavy duty use and can withstand being dropped and kicked around every once in a while. If you are buying pens in bulk, you'll also want to consider price to stay within your budget. Ergonomically designed pens are a great choice for office use to support the well-being of your employees and co-workers. Gel pens are the pens of choice for many people because they provide the best of both worlds—the smooth flow of a roller ball plus the performance of a ballpoint. However, everyone's pen needs and wants are a bit different. There's nothing worse than discovering that your favorite pen needs an ink refill that isn't easily available or economically practical. We carry ink refills in a wide variety of colors, brand names, and price points to help you keep using your favorite pen for many years to come. With this knowledge in mind and a few recommendations to consider, you should now be much more prepared to compare options and choose your perfect pen.Let us know if you have any questions about our pens or need some help deciding which one is right for you. We're happy to help and look forward to introducing you to your new favorite writing utensil.